In the last post about strategic thinking skills, no places have been more important for strategy than in chess and war. In those contexts, strategy intended to render opponents useless. Somehow, that made its way into corporations, where also through strategy, we wage a different battle with products and services. What if you’re someone who wants or needs to become more strategic because of what your current role demands, or to set yourself apart from peers, or you wish to advance to senior leadership? WordPress flagged my section title for being cliché. Indeed it is, but clichés are clichés for a reason: they’re true! Strategic thinking starts by being able to see and appreciate from end-to-end an entire process and related dependencies. Hand in hand with collaboration, a strategic planning approach will involve people from many areas to ensure that a diverse, comprehensive view drives decision making. A person can, and needs to get in the habit of thinking like this all the time. Put more specifically, you need knowledge and other perspectives. Start by casually spending time with leaders in other disciplines and learn their processes, challenges and opportunities. Even consider shadowing such people. Reality check: At this point, let’s be candid about the inevitable reality that some people are “naturally” big-picture thinkers (you know who you are) and some people are more detailed thinkers (you also know who you are). If you’re the latter, it’s very important for you to understand your unique gap, not just try to do a bunch of things to become more strategic. Once you give the tips in this post some thought, run it by a trusted colleague and come up with some ideas for “stretch roles” to close the gap (not a training class!). Trying out strategic skills only in your current role probably won’t work if it’s a role that has you “in the weeds” all day. Apologies for the crude analogy, I actually got that feedback from a boss at my first “real” job out of college. It had immediate and lasting effect, because it was obvious what needed to happen: Look up and forward instead of down at the immediate tasks and crises at hand today. I spent a lot of time with this director picking her brain about how she approaches things, and it become even more obvious what I needed to do differently. Establish a habit of jotting down observations about threats, changes in the marketplace, etc. that can affect your business or area of work. Share them regularly with those that have the power to act on them. Like with my above boss example, talk to someone who you consider strategic about their thought process. Brainstorm with her/him how to think through specific issues. Anticipate and imagine the future through scenario planning. I love scenario planning. It’s such a great process for bringing about ideas, so long as you remember the future is mostly unknown. It’s just a tool and must be accompanied by, sorry, looking beyond the end of your nose. In this case, being open to changes and opportunities. Maybe it’s as simple as a mindset change: instead of “putting out fires” or drowning in a perpetual problem-solving loop, or the “what,” start asking “why.” Initiate a monthly, “Why Instead of What” group (out of the office) to brainstorm on those critical issues. Do not fear becoming the devil’s advocate or being perceived as negative! This is the problem with so many organizations: everybody sees and avoids the most obvious problems because it’s uncomfortable to address them. You want respect, and if you have valid questions that challenge conventional thinking, you will gain respect and strategic thinking skills. You may have to repeat yourself several times because people generally don’t like to be challenged…but that’s what leaders do. 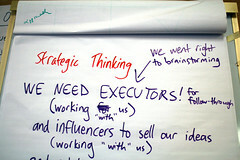 While there are probably at least 10 more attributes to strategic thinking, these are a good start. The important thing is to know your valuable skills and strengths and decide what strategic skills will complement those and how. Then, have some fun doing a couple of things here and there to develop. See the big picture: what are your industry or organization knowledge gaps? Add diverse input into your day-to-day activities. Look beyond the end of your nose: what does that mean for you? Challenge conventional thinking, those things that matter. Next: Next post: I Changed, Where is Everybody Else? Another aspect of scenario planning which may be helpful is planning for risk mitigation. Thinking through what can go wrong helps you think about all of the key dependencies end to end. Of course it can also help protect you against derailing issues which can also make you more effective. Thanks for the comment, that’s a great point!